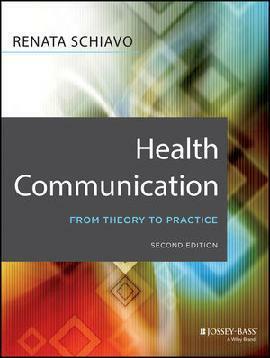 ​Health Communication: From Theory to Practice, Second Edition. ​For additional information, please visit Jossey-Bass, an imprint of Wiley. Companion site (including PowerPoint presentations for all chapters, sample assignments, and other resources) available here. To view a presentation on Ten Distinguishing Ideas for Health Communication in the 21st Century that draws upon this book, please click here. "This new edition superbly blends the practical with the theoretical in a well-structured, updated text on health communication. The author has further elaborated on a particularly critical aspect of strategic communication planning: participatory research, emphasizing a key mantra of health communication: Listen to the people." --Everold Hosein, PhD, senior communication advisor/consultant to WHO and UNICEF; adjunct professor/ coordinator, WHO and New York University Summer Institute on IMC/Communication for Behavioral Impact (COMBI); adjunct professor/codirector, Global Health Communication Center, Indiana University. "This timely, topical, and relevant update captures the breadth and depth of experiences, interventions, and theories. It serves to provision the novice communicator as well as seasoned academics and executives." --Mario R. Nacinovich, Jr., MSC, managing partner, AXON; adjunct faculty member, Boston University; former editor-in-chief, Journal of Communication in Healthcare. "This useful book on the theory and practice of health communication has proved itself in the public health literature. Health communication is integral to public health practice and advocacy and Dr. Schiavo's book is both clearly written and comprehensive." --Sally Guttmacher, PhD, professor, Public Health, New York University. "Reflecting the rapid changes in health care, including patient-centered care delivery, and with case studies from the United States and international sites, this edition will be an essential resource for health communicators at all levels of scholarship and practice." --Marian Huhman, PhD, Department of Communication, University of Illinois, Urbana-Champaign. "Dr. Schiavo has authored a book that captures new trends and emerging challenges in health communication and development. An essential reading for anyone involved in domestic or global public health initiatives." --Rafael Obregon, PhD, chief, Communication for Development Section, UNICEF, New York. "Renata Schiavo, en su obra Health Communication. From Theory to Practice, comparte con los lectores su larga experiencia en el campo....Resalta también que esta disciplina es de naturaleza multidisciplinaria y multifacética; y que las intervenciones desde esta perspectiva deben reconocer la interdependencia de los factores individuales, sociales y políticos relacionados con las condiciones de salud.... Las aportaciones de la doctora Schiavo desde la Health Communication al campo disciplinar de la comunicación y la salud... resalta la integración que hace de los avances de la corriente en un documento por demás accesible y completo, ya que aborda aspectos teóricos, metodológicos y prácticos del campo disciplinar." [In her work Health Communication: From Theory to Practice, Renata Schiavo shares with readers her extensive experience in the field…. [The book] also highlights the fact that this field is multidisciplinary and multifaceted, so that interventions must account for the interdependence of the individual, social and political factors related to health conditions. Dr. Schiavo’s contribution in Health Communication to the discipline of communication and health … highlights the integration of new advances in this field within a document that is very accessible and complete, since it covers theoretical, methodological and practical aspects of the discipline]. Redalyc, Scientific Information System: Network of Scientific Journals from Latin America, the Carribeans, Spain and Portugal (July 2010). To hear Renata Schiavo talk about her book, please click here. This podcast - Talking Biotech with the Public - appeared in the September 2007 issue of Biotechnology Journal (BTJ) and is based on the free BTJ September issue on science communication, biosafety and public perception of biotechnology and GMOs. The podcast features interviews with science communication experts and a humoristic Audio Play of a Journalist-Scientist interview provided by EMBO Science and Society. The last five minutes of the podcast feature Renata Schiavo talking about the first edition of her book as well as her thoughts on the role of scientists in communicating with the public.